• Never miss a call! Your customers can hang up and still retain their position in the queue. They’re automatically called back they reach the top of the queue. • Review how long your customers have waited in a queue before your employees took the call and see the amount of answered and unanswered calls. • Improve customer service by screening calls with the Listen In, Listen In and Whisper and Barge In feature. • Monitor the status of queues by seeing how many callers are in the queue. • Log staff in and out of queues. • Review the time your staff logged in and out of queues. • Wallboards - Display real-time queue and call statistics directly on a monitor. • Get instantly notified when callers have been in a queue beyond the set SLA time. • Meet your customer service requirements by viewing all call events. 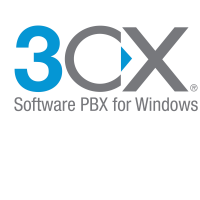 • Integrate Microsoft Exchange 2012 Server's Unified Messaging with 3CX Phone System for its voicemail and IVR. • Integrate your Microsoft Exchange 2012 phone book. • View remote 3CX installs and see the presence of your colleagues in other office from around the world.